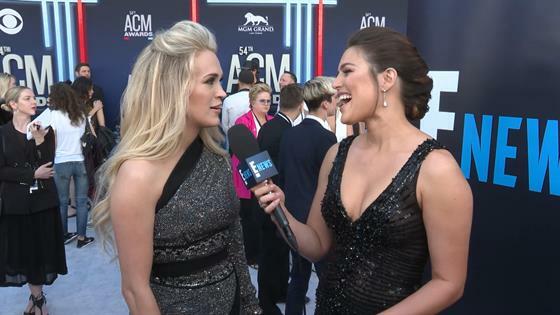 "Jesus, Take the Wheel" because Carrie Underwood looks simply flawless at the 2019 ACM Awards. The "Cry Pretty" singer and her husband Mike Fisher arrived at the Academy of Country Music Awards, which are being held at the MGM Grand Garden Arena in Las Vegas, looking stunning in a diamond embroidered Nicolas Jebran dress that was one-shoulder and had thigh-high slits. Underwood's presence at the show marks her first red carpet appearance since giving birth to her son Jacob Bryan Fisher on January 21. She announced the news on Instagram and shared photos of her husband Mike Fisher as well as her other son Isaiah Michael Fisher holding his new brother. "Jacob Bryan Fisher entered the world in the wee hours of the morning on Monday...his mom, dad and big brother couldn't be happier for God to trust them with taking care of this little miracle!" she captioned the images. "Our hearts are full, our eyes are tired and our lives are forever changed. Life is good..."
Underwood told E! News at the ACM Awards that Isaiah is a huge fan of being a big sibling. The mom of two is set to perform at the show tonight and is also nominated for Female Artist of the Year. When she isn't onstage, she's definitely one to have her fair share of sweet mother-son moments. Carrie Underwood Talks Babies: "I'm a Mom First & Foremost"
The 36-year-old has also been open about postpartum life and what it's been like "bouncing back" after giving birth. On March 19, Underwood posted a selfie after working out and wrote about how she was feeling in the caption. "I'm going to be honest, 'bouncing back' after having Jacob has been much more difficult than after I had Isaiah and I've been pretty hard on myself lately," she admitted. "I go into the gym and I can't run as fast or as far. I can't lift as much weight or do as many reps as I could a year ago. I just want to feel like myself again...for my body to feel the way that I know it can." She wrote a bit about how her body had been "a perfect home for Jacob" and her body didn't feel like her own. "And even now it belongs to him every time he drinks his milk," she said. She added later, "As I prepare for red carpets and for life on tour, right now I make a promise to myself to start appreciating what my body CAN do and stop focusing on what it can't. I promise to stop analyzing every angle and every curve and every pound and every meal." Underwood concluded, "I'm going to keep staying the path because it is a journey and as long as I'm always working towards my goals, one day I'll reach them. I'm going to take it day by day, smile at the girl in the mirror, and work out because I love this body and all it has done and will continue to do!" It's going to be an exciting and busy few months for Underwood. She kicks off her Cry Pretty tour on May 1 in Greensboro, North Carolina and from there travels across the country. Plus, her husband just became an official American citizen! Stay up-to-date at the show with the full list of 2019 ACM Awards winners here. Don't miss E! News every weeknight at 7, only on E! "Avengers" Assemble for Handprint Ceremony Ahead of "Endgame"